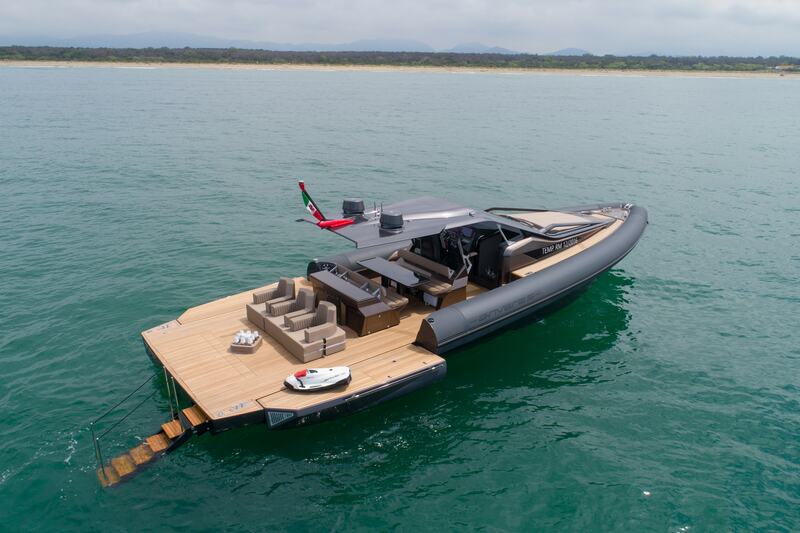 Anvera yachts are high tech power boats, built entirely out of carbon. 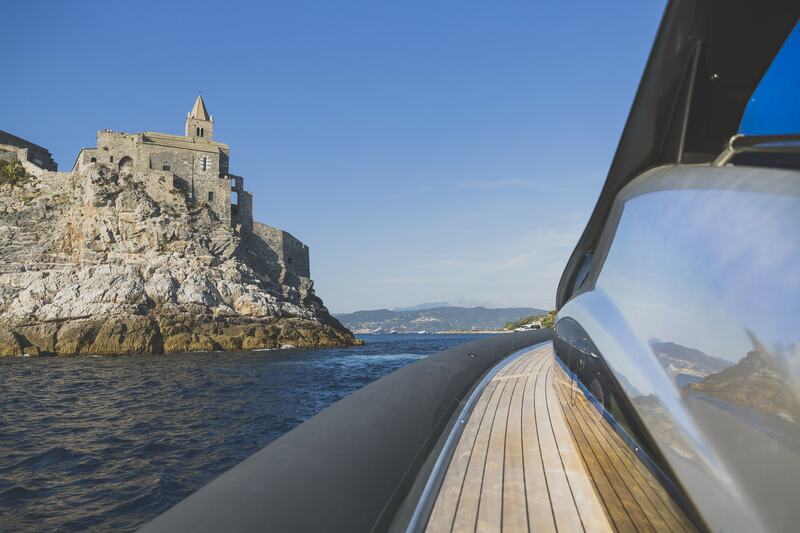 The Italian LG Yacht Srl is the shipbuilder of these innovative yachts. Its origins stem from Team Italia Offshore. During years of building with composite materials in offshore powerboat racing, we found that carbon is the best material for the bigger power ribs. Stepping on board of an Anvera, you’ll immediately feel and see the offshore racing DNA. The numerous innovative features not only stand for impressive performance, but also for a superb feel of comfort. By converting the walls of the cockpit, you easily transform the back of the ship into a floating beach club, to fully enjoy being on the water. Bella Italia in optima forma. Just like the Anvera 55, the Anvera 48 is a powerboat, entirely built out of carbon. It measures 14.50 meters, with a maximum width of 4.91 meters. 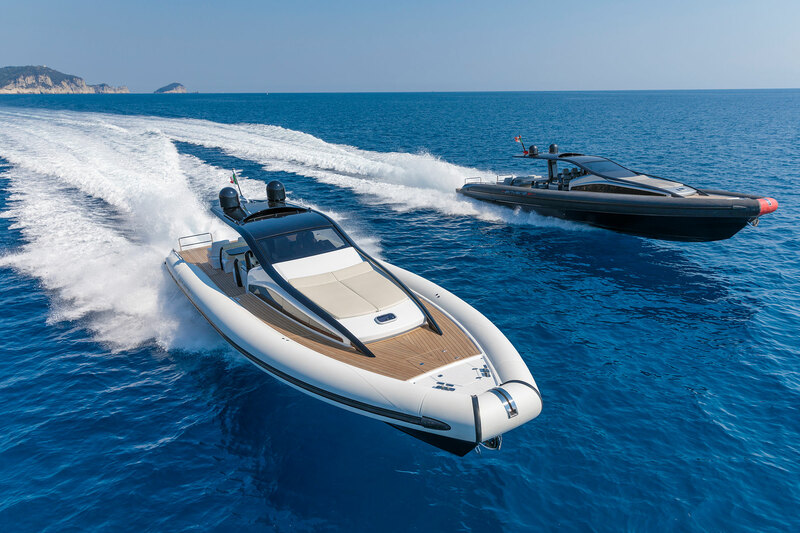 The innovative yacht features two special wing-shaped styles, that run from the cockpit roof via the steering stand to the roof, and through the integrated air scoop in the roof. Spectacular is an understatement for the lower deck; the walls can be folded out, transforming the stern into a beach club of impressive size. The Anvera 48 is a technological tour de force with impressive performance, offering an entirely new sailing experience. With its spectacular design, impressive performance and exterior completely built out of carbon, the Anvera 55 drew a lot of attention when it was first introduced. Because of its carbon-built structure, this yacht weighs as light as a feather, in comparison to other boats of the same size, meaning better performance and less fuel consumption. The easily manageable yachts don’t require a crew. Along with the expandable swim deck and state-of-the-art technology, the Anvera 55 is exceptionally unique. Below the deck, Anvera 55 offers all comfort needed for a longer stay.